As was announced a few weeks ago, this year's WWE Hall of Fame ceremony will be headlined by one of the most influential factions in company history, D-Generation X. All former members of the faction, with the exception of Rick Rude and Mike Tyson, both of which were briefly members, will be inducted. This will be the second time Shawn Michaels will be receiving a Hall of Fame induction, and as we found out on this past Monday's edition of Raw, Booker T will be inducted a second time as part of the legendary WCW tag team, Harlem Heat. We'll also have another two-timer, as Bret "The Hitman" Hart will be going in as a member of the original Hart Foundation. Since WWE is running out of big names who can headline their annual event, don't be surprised to see a few more of these second time inductions in the coming years. While the New World Order didn't end up amounting to much when they came to WWE back in 2002, they were unquestionably the most influential faction of the 90s, as they not only were responsible for Nitro beating Raw for a period of time, but they were also one of the biggest reasons why WWE was forced to change from family entertainment to the "Attitude Era." At this point, when WWE inducts a legendary WCW wrestler, faction, or tag team who either never competed or didn't amount to much in Vince McMahon's company, some fans and pundits scoff at the induction, citing that their WWE runs were either irrelevant or non-existent. Some forget to realize that WWE also owns WCW, which means that their Hall of Fame is open to both companies even though it's promoted as a one-company event. It was recently announced that next year's show will be in Tampa, Florida, which is the billed hometown of Hulk Hogan. 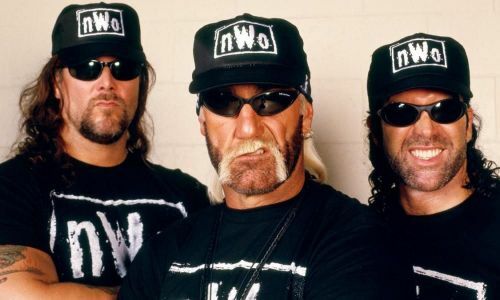 So don't be surprised if you see WWE try to take advantage of that by inducting Hogan, along with Hall and Nash, into the Hall of Fame as members of the original New World Order. Opinion: Does Brutus Beefcake deserve his WWE Hall of Fame Induction?